Hornady is a name shooters trust. Hornady ammunition has been producing quality ammunition and cartridge components for over 60 years. Hornady began from humble beginnings in 1949, producing quality components for American hunters and shooters. Hornady grew greatly in the 1950s and 1960s, and now produces over 1 billion cartridges annually for American shooters, Military, and Law Enforcement. Today Hornady is the largest independent manufacturer of ammunition, cartridge components and tools for shooters. 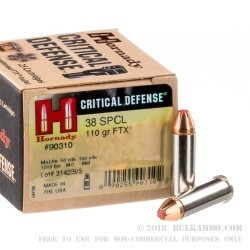 Hornady Critical Defense is built specifically for personal defense and this .38 Special Critical Duty is designed to give you the absolute best personal defensive round for your revolver. 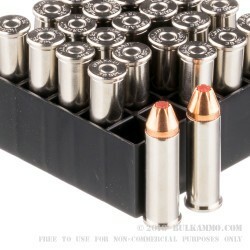 This ammunition is nickel coasted brass casing, boxer primed and reloadable. Q: Can you tell me if this round would be suitable for snub nosed .38s or older firearms not rated for +P ammunition? 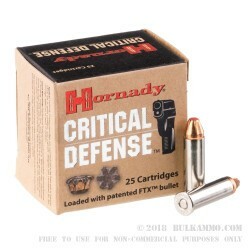 A: Yes, this Hornady Critical Defense is loaded to standard .38 Special velocities and pressures and is perfectly safe to use in older .38spl firearms that are not noted as being safe for .38 Special +P ammo. A: The FTX bullet is designed to have a red tip that will deform slightly under pressure. 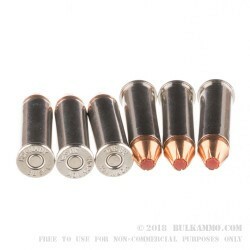 This is so cartridges loaded in a tubular magazine, which means that the primer of one round is contacted by the tip of the bullet behind it, will not fire in the magazine, which would be very dangerous. A side benefit of this is that the bullets are more effective at longer distances because they are more aerodynamic. The 357 Mag 125gr FTX is a good choice for self defense.